They’re proactive in bringing even more improvement to the table, and they are creative. These things will help us differentiate our solution and our business. I’ve been extremely pleased with how De Villiers Walton has approached this engagement. For more than 100 years Ideal Heating, has been keeping British homes warm thanks to its innovative range of boilers, controls and renewable energy solutions. The group’s approach to innovation however, is not just limited to the products it designs and manufactures but is embraced by all parts of the business including, IT. Ideal Heating’s ground-breaking implementation of SAP’s Web Channel Experience Management (WCEM) solution illustrates a company confident of its ability to apply cutting-edge technology to drive tangible business benefit and one keen to maximize the return on its’ investment in SAP software. From a purist SAP perspective the implementation demonstrates the potential of SAP WCEM to the SAP user community not only as a web-shop but also as an e-commerce platform in its own right. In this piece, we look at the business challenges that led to Ideal-Stelrad selecting SAP WCEM as its’ e-commerce platform and its’ experience of working with the specialist SAP implementation services company, De Villiers Walton. Prior to the implementation of Installer Connect on SAP WCEM, the installation partners were required to login to and use three separate third party systems, a process prone to errors and omissions. The group recognised that the installation and registration processes were complex and looked for solutions that would provide an enhanced user experience for both installers and end customers alike. Ideal Heating required the Installer Connect portal to be a simple, stable, scalable solution that would support the installers with the registration of products, the activation of warranties and provide a channel for the group to manage and develop its relationship with its partners. 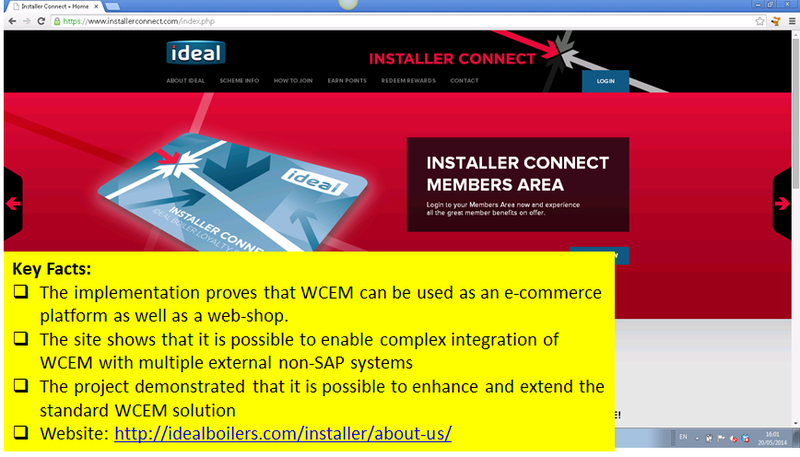 Following a review of a number of options and approaches to enhancing Installer Connect, the group decided to use SAP WCEM as the foundation for the solution. As a well-established SAP customer, Ideal Heating was naturally eager to realise the maximum value from its investment in SAP technology. In order to achieve this with Installer Connect, it was critical that the group could identify a solution that could utilise their core SAP systems and CRM in particular. The Installer Connect portal has become an intuitive, user-friendly one-stop shop solution based on SAP WCEM. It is both scalable and maintainable and provides a powerful platform on which to build further functionality in the near future. Claim loyalty points as well as having access to a wealth of new information such as new product offering. The project demonstrates that it is possible to enhance and extend the standard SAP WCEM solution. Having delivered a successful solution to Ideal Heating, the group, with support from De Villiers Walton, will look for further opportunities to exploit the investment and the WCEM platform.